This keg washer cleans and sanitizes a cornelius keg without having to take apart the ball lock fittings, poppets, and dip tubes. 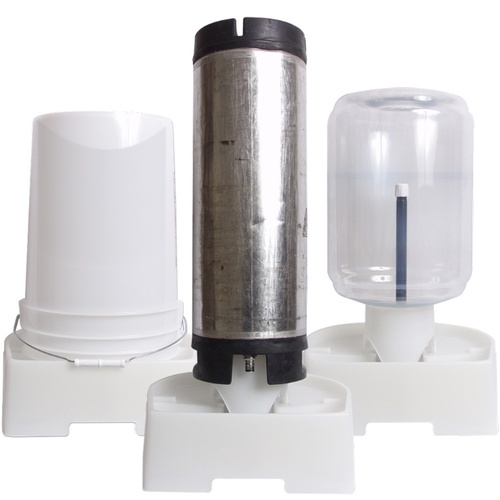 You can clean the keg and the dip tube simultaneously using the T adapter. The keg washer does not have an on/off switch, you can plug it directly into a wall outlet to operate the pump or plug it into an outlet that is controlled by a switch. Never leave the keg washer unattended when in use. When in use, fill the keg washer up to about 1 inch under the brim. The pump is not self priming, so always make sure the basin is full of water before plugging in the pump. Used Corny Keg - Pin Lock 5 gal. I spend hours washing and sanitizing bottles, buckets and fermenters. I want to save time. A friend has one of these and it's amazing! Tired of washing, rinsing, and sanitizing by hand. What is the wash cycle time? I assume you have to change out the cleaner and sanitizer between wash and sani. BEST ANSWER: Cleaning and sanitizing is specified on the cleaner and sanitizer product's label of your choice. Contact time varies. The MKII uses about 1 gallon of fluid for cleaning and I can usually clean about 2-3 vessels at a session. Just make sure you dump all solid matter first. I making a hot cleaning solution (>100° F) and wash each vessel for 30 minutes. I have never used the MKII washer with sanitizing solution but would not recommend it as it would bubble up tremendously! I would suggest mixing a separate gallon of sanitizing solution and getting a chemical grade spray bottle to spray your vessels. 5 Minutes contact time is all you need for those products. Depending if you've left any crud in your carboy I leave them on the washer for up to 20 minutes. If the carboy is clean to begin with, maybe 5 minutes. I'll typically have a wash day where I'll clean multiple carboys so I make sure they're clean to begin with. This way I don't have to change out the PBW after every carboy or keg. Once everything is clean I dump the PBW and switch to sanitizer. Just a minute or two with the sanitizer and you're done. Don't leave a carboy on the cleaner unattended because it can build up so much foam in the carboy the liquid doesn't run back into the cleaner and it will foam all over the floor. They recommend that you wash with warm PBW for something like 20min and rince with warm water after for about the same. I usually just get it going after I mash in and don't really keep track of any particular times. I'll wash whatever needs to be run through all at once and knock out a couple of fermenters and a keg or two during brewday. Depends on how bad the keg is. Buying used kegs I would let it run overnight. You can most likely run sani for only a few minutes. I only used it to clean kegs.. not sanitize them. The kegs came out clean enough that I was confident I could sanitize with a spray bottle and some starsan. Will this work with a fermonster? BEST ANSWER: I don't see why it wouldn't work for your product. I use it for the Big mouth Bubbler, Which has about the same size top as your Fermenter, and for my Corney kegs and buckets. I would email Mark II and just ask. I emailed him for questions before and he will respond. Nice guy. Hope this helps. Should work fine but be mindful of its weight, may have to weight it down due to pressure. Also, foam might develop so keep an eye on it if indoors. I always pre rinse things first and this unit has always performed well for me. It should work just fine. Even if the neck of the Fermonster doesn’t fit inside the carboy stand part of the cleaner, you can remove that and just ballance it over the top of the pump. Will the Mark II Corney Keg washer work with the torpedo style kegs or only the corny style kegs? BEST ANSWER: I have AEB and Kegland cornies and one Torpedo (that I don't like so won't get more) and the washer works fine with all 3. I have a friend who only uses torpedoes and he owns this washer. Do you know who could provide me with a replacement pump impeller assembly? BEST ANSWER: You will probably need to contact the manufacturer directly. Just the pump isn't an available product in the market place (I am a retailer who sells these, and I have never found just the pump). I would contact the manufacturer and see if you can order one from them. Awesome product, works as promised. The bottle washer attachment is another story. 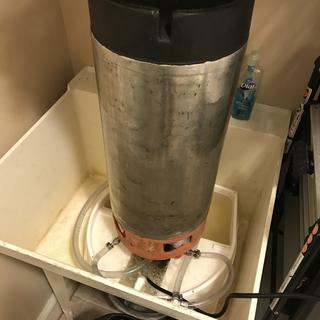 this keg and carboy washer works great, saves water and PBW! Very impressed! Used it to clean and sanitize some 5gl kegs and 8gl bucket fermenters. Worked like a charm. Nice to walk away while the whole thing gets cleaned. Of course the temp of the cleaner drops quickly but I don’t think that matters much. You could always add more hot water/detergent if you want. Haven’t figured a good way to get the bucket lids into the device but easy to handle separately. Pretty good while it lasts, but the pump failed after a couple years, and I only brew 8-12 times per year, so I wouldn't recommend this unless you have money to throw away. The collar is flimsy and difficult to attach. The hose nozzle shifts around. My pump broke after about 6 uses. It does not clean both keg posts. If you want to clean kegs, use the Ss Brewtech Keg WaSsher. If you want to clean carboys, soak in PBW and use a carboy brush (you'll do a better job and it ends up being easier when factoring in the setup). I don't know why I did not buy this years ago. It has been a miracle that I was able to sanitize properly without it. It is one of the best purchases in a long time, and made my life much easier. Simple design, made easy work of mundane tasks. Simple build, includes a Tee fitting for the liquid line to also clean the dip tube in corny kegs. Let's you get other things done while this runs in the background. A second one to run PBW while this one runs StarSan would be even more efficient use of time. It would be a little more convenient to have an on-off switch instead of constantly unplugging it but for what it does, it works perfectly. Digging this little thing. It’s simple , but easy and effective. This unit is absolutely awesome. It does a great and very thorough job of cleaning and sanitizing both kegs and carboys, and with very little water mess. I would definitely recommend it. I can’t imagine washing a keg any other way. Love this keg cleaner, and easy to use. Recommend you get the option Ball Lock Keg Rinser although I had to swamp the Ball Lock out for Pin Lock. Combined it does a great job. I put PBW and hot water in the bowl, pre-rinse the keg, attached the valve locks, and plug it in for 30 minutes. Keg cleaner in action in laundry room sink. If you don't have one-get one. It may seem extravagant, but once you own one of these babies you'll wonder how you did without it. I'm considering a second unit so that I can wash/sanitize kegs and carboys simultaneously (we do this during group brews with the club and it's awesome!). The line cleaning feature is a major plus as well! While it does do the job advertised, its not the fastest, but that does give you time to do other things in the interim. But I would not recommend using this for cleaning fermenting buckets unless the bucket was first quick cleaned in the sink since there is only a one gallon reserve of fluid and the holding tank would get overwhelmed quickly with the sludge from a fermenting bucket. This is a gimmicky item which I would not consider rebuying once it is done. But the pump does have a good second use, i.e., pumping cold water from my cooler through my wort chiller since the flow rate is perfect for a fast chill of hot wort. Works as advertised! It makes cleaning fermenters and kegs super easy. I've owned it for a couple of years and have only used it on a few occasions. While it has worked ok, it requires longer than you think to attack stubborn stains. Additionally, my pump died after less than 10 uses...not good. I've gone from using PBW to Brewmeister alkaline wash, and use 2 scoops in a gallon of water for my fermenters and swish it around...works great. Pump broke after seven months. Asked for replacement, but got a lot of excuses and assumptions about usage. Don't waste your time or money. Less than 2 years and less than 20 batches. Built cheaply. I knew it wouldn't last forever, but I expected it to last longer than this. Pump is failing. Plastic tab that holds the keg stand broke immediately. Good idea, but could have been designed better. The product itself is great-Kegs & carboys end up extremely clean/sanitized with very little effort. I've saved a ton on PBW and starsan using this thing. A lot of the complaints are valid, such as the tabs popping out on keg/carboy stand. I've never had this happen with a keg or carboy in place, just when I was removing one. The biggest issue is the quality of the fittings for cleaning dip tubes-the barbs are extremely flimsy. I've babied them, but they've finally broken off. It has been about 2 years, but as this is a component that never sees load, it should never happen. This machine works great on my carboy! While my carboy was cleaned when I last used it, I used this washer to sanitize it for my next beer before putting the wort & yeast in. I am getting used to Star-San & not clear about how much to put in. A little goes a long way & if you put in too much, the foaming inside the carboy with this machine will build until it impedes with the vertical spray coming out of the pipe. Then the spray will not reach the bottom of the inverted carboy. I guess this is one time when the foaming action of Star-San may be an undesirable. I will get past that & put in less Star-San because this machine really whips it up! This thing is just grand. I hate cleaning. In order to brew today, yesterday was cleaning day for my SS Brew Tech Buckets and kegs and this thing tore through the job in record time and I barely even had to get my hands wet. I'm so impressed. I only ran each one with PBW for 20 minutes, then a rinse and a final run with starsan for 10 minutes. There was a hint of the krausen-line still present in the fermenters but it wiped out easily with a paper towel. For keg cleaning you need a length of beverage tubing and a black keg fitting (and the same for the gas side, but a grey fitting). I also plan to link the output to a keg with some PBW in it and then to my draft system to use it as a draft cleaner. If it lasts for at least a year I'm happy. The idea is simple yet brilliant. Hopefully they'll come out with some new spray balls for different applications - coupled with a garden hose QD this could be even more versatile than it already is. Couldn't be happier with this purchase. I make 20 gallon batches and cleaning and sanitizing 4 kegs was not only time consuming but used a lot of sanitizer and water. This only needs just over a gallon of water and I can sanitize all 4 kegs very quickly. The pump died at around 6 months, but Mark sent me a new one with 2-day delivery! While I love brewing- I hate clean-up. This is a huge time saver. While I've only used couple times- results have been perfect. I don't think it is even 20 minutes and carboy is perfectly clean. Only complaint- I should have bought this years ago. My wife picked this up on a deal of the day. Great water saver and I no longer delay in washing/sanitizing my kegs. A great gadget to save time and water when cleaning kegs. It's nothing complicated. It's a submersible pump w/ a few fittings and a cleverly designed base, but it works very well, and does a good job cleaning. With a few more fittings and a bucket, you can adapt the pump to a recirculating beer line cleaner. If it doesn't do the job completely, it softens up the crud enough that it makes the rest of the job easy street. 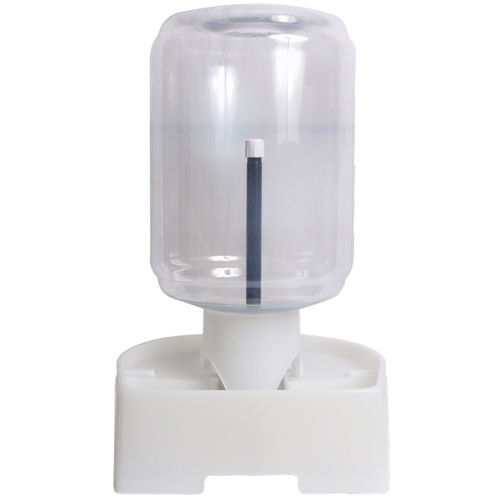 I've had the keg/carboy washer for nearly two years and use it frequently. The pump puts out a good pressure stream and I love the ability to wash out the dip tubes of the keg without disassembling them. Washing kegs and carboys is very easy. You use much less cleaner, since I typically will wash multiple kegs on the same day, and can re-use the PBW in the basin for multiple kegs (as long as they aren't too soiled). Much quicker than doing the "PBW soak" method, and uses MUCH less cleaner. I put a high premium on products that "just work" and this one does that. The only thing that could make this better is to have some sort of heating element built in (perhaps in the pump) to keep the recirculating water at a stable temp, but that's a small concern when using the product. Great addition to the brewery. Some hot water, a little PBW and my plastic fermenters are clean within minutes. No more soaking overnight. You could try to save some money buying a pump and parts seperatly but I have found this to be well worth the money. I bought it to clean kegs and carboys but also was surprised to find it set up to clean beer lines as well. It is much better to circulate cleaner through beer lines than to just soak them, and it is easier too. This keg washer is great is you have a lot of kegs to wash, like after a big pool party. How'd I live without this? This thing is amazing. I now use a fifth of the sanitizer and cleaner than I used to. Allows me to walk away and take care of other tasks on my brew day. I've found it to have plenty of pressure to clean and rinse my carboys, buckets, and the basin hold my air locks and all small parts I need to sanitize. After I switched to kegging, this thing paid for itself in the time it saved me cleaning all of the parts. Great for cleaning out carboys, too! My only real complaint is that I wish the pump cord was about 1 foot longer. Other than that, it's a great piece of equipment; I use it for cleaning kegs that I've fermented in. I've never had an issue with gunk after cleaning, but I don't allow the kegs to dry out and I always give them a quick scrub with a sponge first. I love this product and wish that I had bought it years ago. It saves me at least an hour of cleaning on every batch of beer, which translates into more time for brewing more beer. Instead of scrubbing the fermenter or keg, filling it with PBW, and then soaking for hours or days, I can have it cleaned and sanitized in under an hour, with only a few minutes of active work. I've used it several times now to clean carboys, Seidel fermenters, and many kegs. It does a better job of cleaning than I was doing before, while saving time and money. As other reviewers have mentioned, it also saves on PBW and sanitizer, since you only have to mix up a gallon at a time instead of 5-6 gallons for the soaking method. Between the time savings and the reduced chemical costs, this should pay for itself within just a few batches. It does do a nice job with my kegs. In terms of the better bottles, there can still be some yeast cake on the sides even after 40-60 minutes. I made an adapter with parts from Lowe's so that the water stream hits the yeast ring exactly.much better, but not the "set it and forget it" I was hoping for. The washer really does a good job and saves me time, I've used it on kegs (with the purchase of a ball lock and tubing), carboys and buckets. The pump doesn't quite have enough pressure to wash my 6.5 gallon glass carboy without shifting it around a bit, not a huge deal. I went with this over a DIY solution since my SSTech Brew Bucket fits perfectly. I'm also looking forward to getting the bottle attachment and giving it a try. It is easy to set up and run. Saves a ton of water as it only uses a gallon while it recirculates in the basin to the pump to what it is cleaning. I load this thing up with water and PBW and it does all the legwork. Awesome that it cleans the beer dip line as well. I still disassemble the inlet outlet and clean them separately, but it is probably only because I am super detailed in cleaning and sanitation. I have never seen or encountered any gunk when taking them apart. I love my keg washer, makes my brewing sessions go so much smoother. I can just mix up some PBW and let it run while I wonder off to do other tasks and come back later to swap out for something else to wash as needed. I just wish I could find spare connector parts as the white T connector piece has broke on me, my fault trying to pull the hose off the thing. I really like this product for cleaning out my keg dip tube and my 3 or 5 gallon glass carboys (mead, cider, strong batches). However, it isn't great for kegs. I find the kegs fall over too easily, which is fine since they aren't breakable, but still annoying when water starts flying everywhere. I would still recommend it, just don't expect miracles. 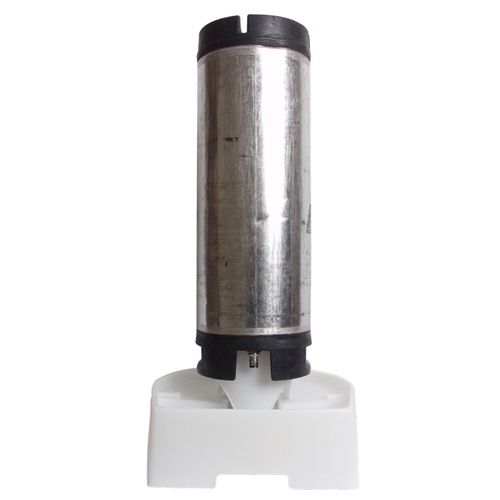 The Mark II Keg & Carboy Washer helps save time when cleaning and sanitizing multiple carboys or corny kegs. The effort in setting up the cleaner is diminished when only cleaning one but for cleaning multiple fermentation and serving vessels is well worth it. One slight downside is that cleaning and sanitizing solutions can foam quite a bit. Saves time, money and your back! I've owned my keg washer for over 2 years now. I stopped fermenting in carboys long ago - so I just use it to clean and sanitize 5 gal kegs. Filled to the top of the pump the keg washer uses 1 gallon of water + PBW or StarSan. I can easily clean 4 kegs with 1 gallon of hot water and a 25 min recirculation on each one. Rinse everything out, switch to 1 gallon of StarSan - and 2-3 minutes of exposure is all that is needed! I used to fill one keg up with 5 gallons of hot PBW and soak, then transfer to each successive keg. What a waste of PBW, water, money and my back! This cleans better, with less effort, and paid for itself in no time by using less chemicals! I had some issues with my pump a few months ago and after a few troubleshooting emails to/from Mark everything was resolved! Great customer service and a solid product. Wish I would have bought one long ago. I just bought this keg and carboy washer. I put PBW in and filled with water and then ran 6 corny kegs through the washer with the same water. Several kegs had crud on the bottom, and the washer cleaned all of them; I did use a brush to loosen the crud on one of them. 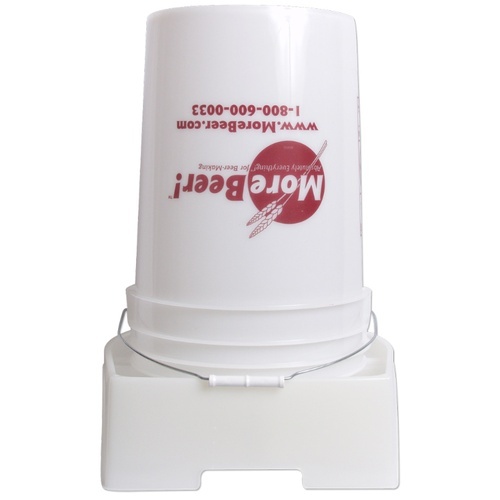 This is a great product to clean kegs and carboys, and it is a big plus also to save water!